This is a great starter or main course for those impromptu summer parties. Feel free to add in some hot Cajun chicken also. Begin by making up the dressing - put the garlic puree into a bowl with the lemon juice and mixed herbs. Whisk in the olive oil and store until required. Heat a large pan and dry fry the bacon until it is crispy. In the meantime place the slices of bread onto a flat baking tray, drizzle with a tablespoon of olive oil, season with salt and pepper and pop into the preheated oven for 10-12 minutes until they have turned crispy and golden brown. 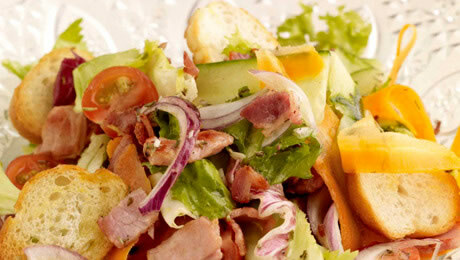 Mix together the salad leaves, tomatoes, cucumber, ribbons of carrot and sliced red onion. Pour on the dressing, add the large croutons and mix well until combined. Divide between 2 large serving bowls and scatter some of the warm crispy bacon on top.